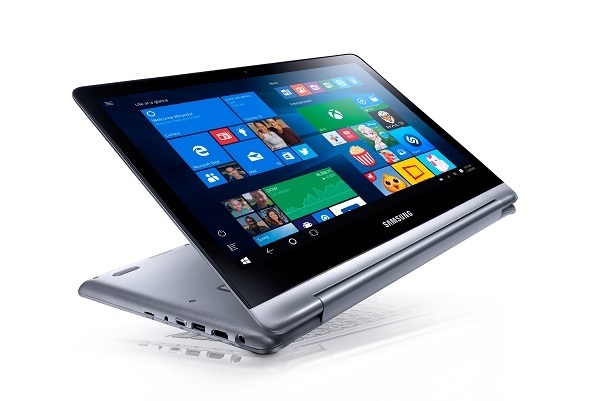 SAMSUNG launches Notebook 7 spin with Windows 10 and fast charging. Samsung Electronics America today announced Notebook 7 spin, a new laptop designed for multimedia enthusiasts. The new PC offers a Full HD display with Video HDR mode, expandable storage options, Windows 10 and fast charging capabilities. The Notebook 7 spin is built with a 13.3-inch/15.6-inch Full HD touch screen with Video HDR mode, which when turned on can make the content sharper, colors more vivid and textures truly pop. Video HDR mode instantly optimizes the video experience, so that every little detail comes to life, drawing users in to all the action. The Notebook 7 spin has a 360 degree touch display that offers users incredible viewing angles. It comes with a 6th generation Intel Core i5 or i7 processor, an impressive 1 Terabyte hard drive, and upgradable RAM and SSD options. Utilizing the fast charging functionality, the Notebook 7 spin is engineered to accomplish more while being tethered less. With just 20 minutes of charging, battery life is extended up to two hours. In just 90 minutes, the 15.6-inch notebook will be fully powered, while the 13.3-inch reaches a full charge in 100 minutes. Utilizing Continuum, the PC can be transformed into three adaptive modes: use it as a notebook to touch and type as you connect with friends, stand it up to enjoy the latest movie in tent mode, or switch to tablet mode to surf the web. Additionally, Samsung architected an auto backlit keyboard, allowing for comfortable typing in low light conditions. The Notebook 7 spin will be available beginning June 26, 2016 at Best Buy and BestBuy.com, as well as Samsung.com, starting at $799.99.